SUNDAY LOVE. #3. | Life Looks Perfect. Morning folks. Sometimes I think is nothing more beautiful than flowers. Growing up, I always knew I was going to end up being a florist, helping out every Saturday at our flower shop on Fulham Palace Road, working during the Summer holiday and always playing around making my own displays even as a child, flowers make me happy. I would say it's only in the last four years that I have really shone as a florist, creating pieces from my head that I never knew I could even do and I find myself constantly bringing them home with me - I can't bare to throw them away! As I am writing here at my desk, I'm surrounded by bunches of Daffodils and Anemones...Bliss! I am thinking about sharing this with you all in a post soon if you would like to really see what I get up to at work. One blogger that I am pretty sure you will know about is Jane from British Beauty Blogger. Not only is her blog the go to for all things new and beautiful in the beauty world, Jane has also started her own YouTube channel. Subscribed from day one last Summer, I think it is so interesting and rather intriguing to watch Jane share her inside knowledge, latest beauty news and wise advice for bloggers. I think we are all pretty lucky for Jane to have started YouTube as just like her blog, she speaks frankly and honestly in all her video's about the blogging world and beauty industry, that some of us might have not been aware of before. If you are a new blogger I would definitely recommend watching them, as she gives sound advice. I have to admit though, two of my favourite video's that Jane has filmed has to be her Dior and Chanel collections. Do I have to say more...you need to go watch and drool ladies! Don't get over excited ladies, no this isn't a brand new release, it's just me being very late to the band waggon only due to the fact that I could never blooming find these lippies in my local Superdrug! So as you can tell, this is one of the MUA 1D lipstick adorned by Liam c/o, which is just one of the five lipsticks that have been created to add to grab the girls attention hehe. Priced at £3 each, this lipstick is a fab little addition to my lippy collection, as it is not usually a colour I would pick from the shelf. 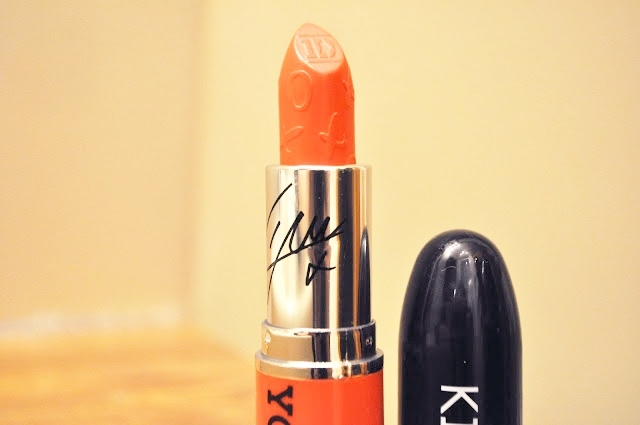 It is a beautiful bright orange coral with a warm undertone of red that glides onto the lips with a slight shimmer. With a similar tone to my holy grail, Mac Lady Danger, this lipstick is a nice change from my addiction to Matte lippies. Matched with a rosy cheeky and simple eyes, this lippy is such a bargain and with a stay on power of about 4-5 hours, it certainly has impressed me. Nothing like a pop of colour to brighten dull Wintery days. Today my written love is from a lovely new blog find. Randomly via the usual Sunday night twitter chat #bbloggers, this lovely lady sent me her blog link. Meet Hayley from Tea Party Beauty. Only starting in April 2013, Hayley's blog is filled with great reviews and posts that I know I have certainly learnt a thing or two from! The reason why I wanted to mention her blog in particular is that she shared the loss of her cat online, which I am sure for alot of people, they would think oh its just a cat but to me I am a pet obsessive and her post really made me thankful for all the years I had with my old boy Mr Grolsch. I think Hayley wrote about the pain I certainly felt and I wanted to share it for anyone who has lost a pet and feels that hole in your heart. You may be reading this thinking what the hell, there just pets but for me and Hayley too, these pets were more than just an animal, they are friends, someone always there no matter what. I know I shared a few tears my old boy and I miss him every single day. You can read Hayley's post HERE. As I mentioned, this week we were working at Top Drawer with our candle brand and this for me was already a nightmare in my head. But I have to say for the first time in months, I was in a good place where I was talking to buyers, stepping out of my comfort zone and finally getting excited again about what the future is going to hold for us as a family. I have to just write here also that you all know by now my anxiety is the biggest demon holding me down at ever step but on Monday, I got on a tube and travelled to Top Drawer by myself! To say I was so proud of myself is an understatement. It certainly showed me that with one little step at a time, I can beat this. I hope you have a lovely end to your weekend and make sure you enter my first blog birthday #LLPGiveaway! TAGS LIFESTYLE., MAKEUP., SUNDAY LOVE. I love these posts - such a positive roundup of the weeks favourites. British Beauty Blogger does the best videos. She is short & to the point. I really enjoy them.